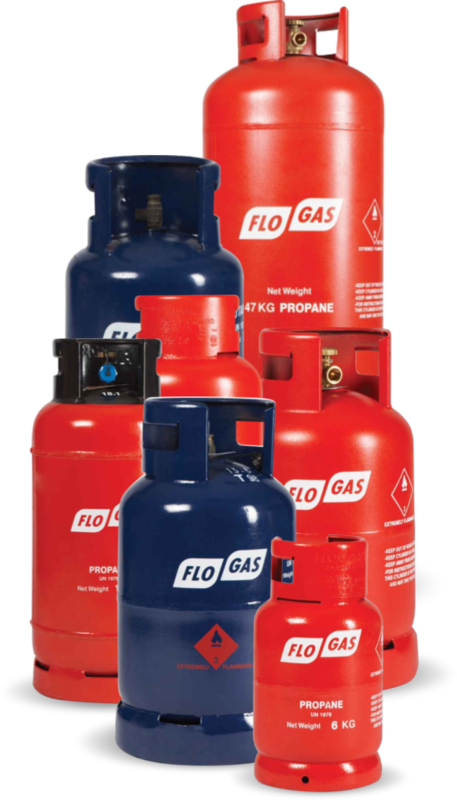 We stock Flogas which is a trusted brand of bottled propane and butane widely available in the United Kingdom and Ireland. There are many uses for Flogas gas, whether it’s in the home or when you’re on a caravan holiday. The largest cylinder, which Is 47kg can even be used to supply your central heating system, providing it’s no larger than 60kw, as well as your cooker and fire, but such is the versatility of Floga, it’s also very popular for use in leisure activities such as barbecues and heating and cooking in caravans or motorhomes. Like Calor Gas, Flogas cylinders come in seven different sizes to suit all needs and spaces. These range from 7kg and 13kg bottles for butane cylinders, to 11kg, 18kg, 19kg and 47kg for propane cylinders. When using a Flogas gas supply, you will also need to fit a valve and regulator to connect the system. The size of valve and regulator needed will depend on the size of the bottle, so it’s always wise to take instruction from an expert before you buy. There are many reasons why now is the right time to switch to Bottled Gas over other fuel options. Currently, Bottled Gas is the closest off-grid alternative to natural gas, making it a far cleaner, greener and more efficient alternative. IT also emits far less CO2, NOx and SOx than oil, which in turn means it produces fewer particulates. Furthermore, if you install Flogas in conjunction with one of their specialised boilers it could save you money on your energy bills as they’re more efficient and often require lower maintenance. As with any bottled gas, safety is paramount and you should always take certain safety precautions when moving, installing and storing your gas cylinders, whether that’s in your home, caravan or outside. When moving your gas cylinders you should always be mindful of their weight and that should always be moved in an upright position. It’s also advisable to wear gloves as bottles can sometimes be wet and slippery. You should also remember that when your cylinder is empty, there may be a small amount of gas remaining in the bottle. When it comes to storing your bottled gas, they should always be stored upright and in a well-ventilated place. It may sound obvious, but also ensure all your gas bottles are stored away from heat and ignition sources, and if stored outdoors they should be kept well out of the way of entry or exit points and drain. In addition, you should never store your bottle underground or use them in an area where gas is prohibited, such as a high-rise flat. However, for indoor use in a residential property, it is possible to use butane cylinders up to 15kg - ideal for an indoor heater. At RGC Building Supplies, we not only have expertise and experience in Bottled Gas Products, as well as other building materials, including electrical and other fixings. Whatever you need when it comes to building supplies, don’t hesitate to get in touch for assistance.